An aluminum fence is constructed out of aluminum, a low-density metal that offers a higher corrosion resistance. Aluminum is used both for commercial and residential properties and is available in a wide variety of styles. It’s easy to clean, versatile and low maintenance and will last many years. At New Jersey Best, we stock a range of aluminum fence materials available in a range of different powder coating colors. There is a difference between residential grade and commercial grade aluminum fencing. Residential grade fences are durable, secure, but they are also versatile and light. They’re available in a number of different colors, styles, and designs. They are easy to install and great to keep pets in and prying eyes out. Commercial grade aluminum fences are heavy duty and are designed specifically for security purposes. It’s a lot heavier than the residential grade and is much more effective against harsh weather conditions. Commercial grade aluminum fences are generally used for public swimming pools, high traffic areas, sports stadiums and other areas where high security is needed. 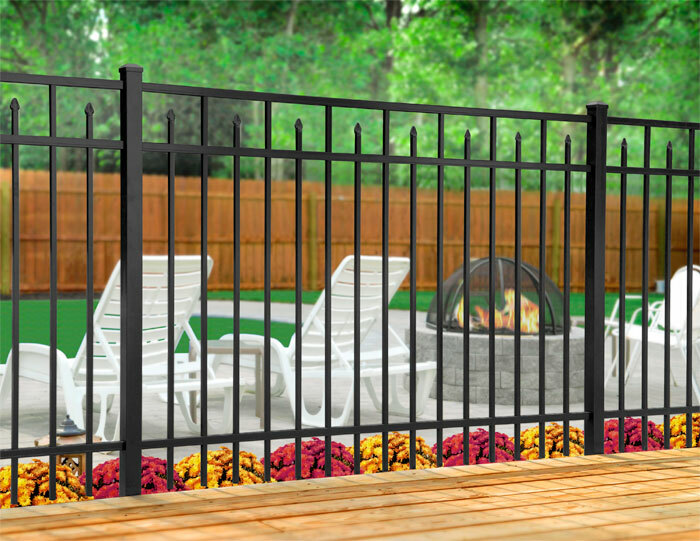 At New Jersey Best, we can custom design your aluminum fencing. No more boring old grey fences, when we stock a range of attractive designs. Choose a color to match your home, or brighten your street with something unique. Common colors include satin black, gloss white, chocolate, silver, walnut, bronze and gloss beige. when compared with other similar fencing options, including iron and steel, aluminum fencing is considered to be extremely affordable. This is because it is easier to purchase and cheaper for manufacturers. Although it might cost more than a wood fence or a chain-link fence, it will last for decades. One of the most popular reasons people purchase aluminum fences is because they are guaranteed to last. Aluminum is corrosion resistant, and will not rust or rot. This makes it ideal to use in all types of environments. Aluminum fences are a low maintenance option. Talk to our friendly staff to find out how you can keep your aluminum fence looking its best to ensure a long life. You might consider powder coating your fence with an environmentally friendly option, however, unlike wood fences, there is no requirement for sealants or paint. And keeping your aluminum fence clean will enhance its lifespan clean. We can provide you with some great tips on how to do this. One of the best things about aluminum fencing for properties is that you can adjust it to suit your requirements. Aluminum fencing can be installed both on sloped or flat land, can be created at different heights, and is suitable for a range of situations. If your property is located on a slope, aluminum fencing can be adjusted to suit. 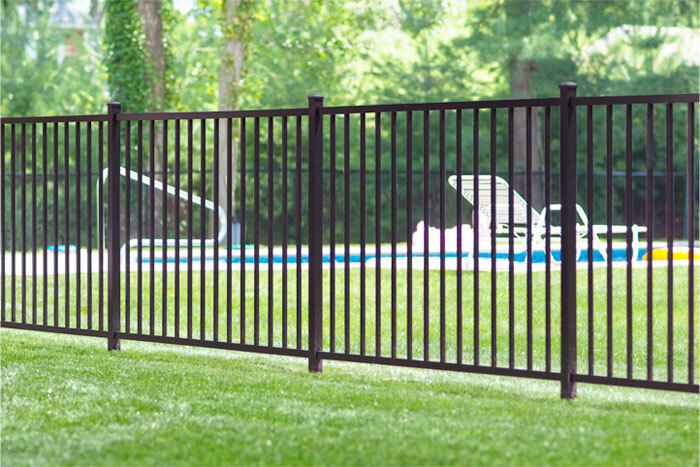 Aluminum fences are often used for areas that require high safety, such as pools. Therefore aluminum fences need to adhere to government regulations to ensure they keep you and your family and pets safe. As well as being safe aluminum fences are also secure. They are not easily scaled like wooden fences and cannot be cut like chain link fences. Not only is it possible to purchase aluminum fences that are made from recycled materials, but when you are finished with your current fence you can send the materials straight to the recycling center. On average you can expect to pay anywhere between $100 and $200 per meter square for powder coated aluminum slat fence; up to $1200 per meter square for rendered brick and aluminum; and up to $1000 per meter square for sandstone and aluminum. These prices may vary so ensure you ask the right questions to our experienced team. Why choose us for your aluminum fencing? There are many benefits to an aluminum fence. Be sure to get the type of fence that meets your exact needs. At New Jersey Best, we have local knowledge and experience that is 2nd to none. This allows us to provide you with everything you need to ensure the security of your property. 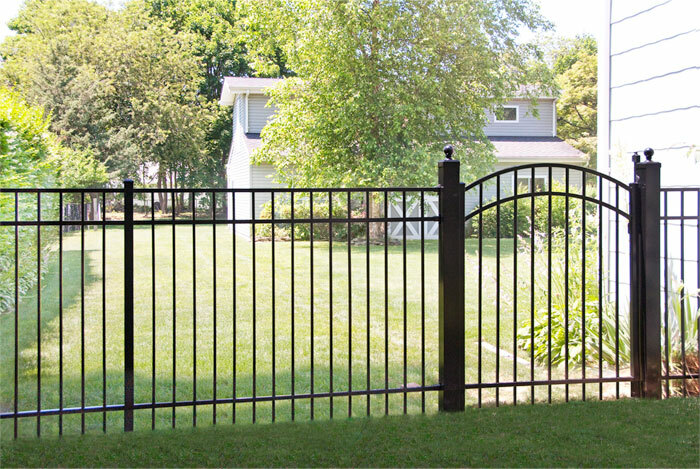 Our aluminum fences are available in all styles with matching or custom designed gates.